The Rio fisherman series continues, with especially reliable technical and construction characteristics, capable of coping with any weather and sea conditions and yet so comfortable and elegant. The new Rio 800 Cabin Fish is a successful example of this difficult combination between practicality and leisure, reliability and style; she perfectly interprets the new Rio philosophy for this type of boats with a growing number of followers. The Rio 800 Cabin Fish is a practical boat for all occasions. 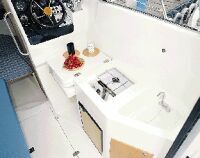 The cockpit is very ample (larger than 53'10" sqft) and is suitably fitted for fishing - lockers, fishbox, low sides, aft platform access port, etc. 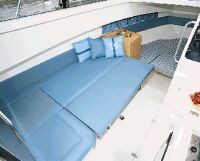 Belowdeck, there are four berths and the salon includes the central dinette and galley. Visibility from the interior helm station is excellent. The flying bridge may be used as a sunning platform, access ladder is from the cockpit. Different power combinations are offered for a complete range of excellent performance - prices vary accordingly. The cheapest version with 225 hp or 2x141hp gasoline engines is Lit. 100,000,000. The new Rio philosophy that lies behind the Rio 800 Cabin Fish combines comfortable cruising with reliable fishing. Full boat displacement: 6.622 lbs. Notes: optional power, 1x225hp B stern drive, 1x170hp Turbo Diesel stern drive, 2x105hp Turbo Diesel stern drive, 1x200hp Turbo Diesel and 2x150hp Turbo Diesel with V-drive transmission and in-line shaft. Deck and cockpit characteristics and fittings: stainless steel pulpit, reinforcing backup plate for fighting chair.